Is Nike, Inc. Set Up for a Fall? Nike stock has enjoyed a tremendous run in the past several years, but its valuation is looking riskier than ever. Athletic-apparel giant Nike (NYSE:NKE) has richly rewarded its shareholders with stunning returns. In fact, shares of Nike have more than tripled over the past five years, massively outperforming the broader market. As a result of this massive rise, the stock looks overvalued. It's true Nike's huge stock-price gains have come as a result of earnings growth, but it's also true that Nike has experienced a significant multiple expansion. In other words, yes, Nike's profits are growing, but a large part of the stock price rally is due to investors who are simply willing to pay a lot more for those profits. There's sometimes a difference between a great business and a great stock. Even outstanding companies that grow revenue and earnings at high rates can amount to poor investments - if too high a price is paid for that growth. 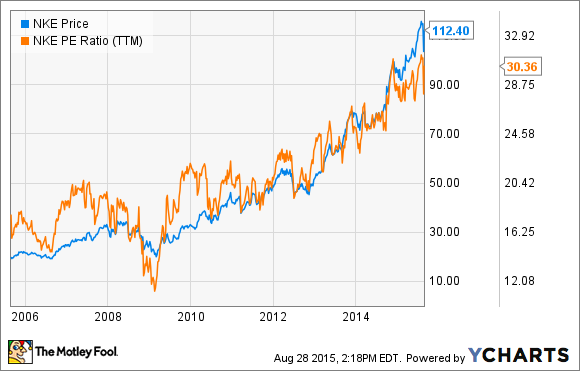 Needless to say, Nike's stock price, and its valuation, are both at 10-year highs. The company is growing, but not fast enough to warrant such a valuation. It recently concluded its fiscal year, and the results were good: revenue grew 10% to $30 billion. Earnings per share grew 25% for the full year, to $3.70 per share. That's a great performance, and investors have become increasingly confident in Nike. That's why they're willing to pay 30 times earnings. But every company carries a certain level of risk, and Nike is no exception. Going forward, Nike has some potential headwinds that could weigh on growth. First and foremost is Nike's exposure to the international markets and, in particular, some emerging markets that are looking shaky. For example, 54% of Nike's revenue last year was generated outside the United States. In fact, Nike generated $993 million of profit from China last year, and another $818 million from additional emerging markets. Collectively, those two regions themselves account for 37% of Nike's total annual profit. China is one of Nike's highest-growing markets. Last year, profit in China rose 22% year over year. That made China Nike's second-fastest growing region after Western Europe. If the prospect of slowing growth in China proves accurate, this could be a significant drag on Nike's earnings growth in the coming quarters. If that happens, investors may not be so willing to pay such a high multiple for Nike stock. Nike is a strong business, with one of the most universally recognized, valuable brands in the world. Yet I'm inclined to avoid the stock at its current price. Nike is highly exposed to China and the emerging markets more broadly, and any economic slowdown there could affect Nike's growth. The company has an added potential headwind in the form of foreign exchange. The rising U.S. dollar is wiping out several percentage points for multinational companies that do a lot of business overseas, such as Nike. I don't see the potential for compelling future returns at such a lofty valuation. As a result, I'm going to wait for a more attractive valuation before buying shares.